The three case studies highlight diverse situations and ways in which households have coped with climatic variations and other stresses. A rich literature now exists on coping strategies, capacity to withstand shocks and stress, and more generally vulnerability. A few observations on vulnerability frameworks are now presented as an introduction to the following section, which specifically addresses the intersection of vulnerability and climate prediction. Vulnerability can be defined as the "degree of loss resulting from a potentially damaging phenomenon" (UNDHA, 1992, p. 63) or "the insecurity of the well-being of individuals, households, or communities in the face of a changing environment" (Moser, 1996, p. 2). Critical questions are: What determines the relationship between a hazard and its effects? Who is vulnerable and why? These questions require a broader analysis of vulnerability. This amplification of vulnerability stems from the literature on development and livelihood security [e.g., see Chambers (1989) and Dow and Downing (1995)] rather than the more circumscribed work on disaster relief. 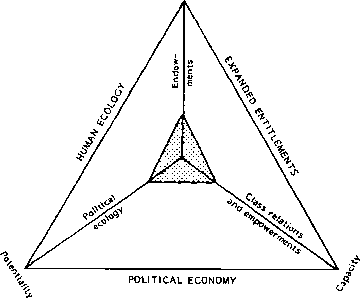 As such, it begins to place vulnerability in the wider structures of political ecology. Figure 1 Three dimensions of vulnerability. The fundamental processes that determine vulnerability are implied in the conjuncture of the human ecology of production, exchange entitlement, and political economy. Vulnerable groups can be located in different sectors of the triangle. For instance, subsistence farmers would be more dependent on their land and labor resources than on market exchanges. The destitute and refugees are closely tied to the political economy of aid. The urban poor are dependent on what they can earn in informal markets (after Bohle et al., 1994). integrates environmental, social, economic and political exposure to a range of harmful perturbations" (Bohle et al., 1994, pp. 37-38). In one of the fullest treatments of vulnerability and disasters, Blaikie et al. (1994) regard vulnerability as a product of such characteristics as ethnicity, religion, caste membership, gender, and age that influence access to power and resources (Fig. 2). One application of the concept of vulnerability is in the U.S. Famine Early Warning System, which monitors food crises in Africa (Fig. 3). • Vulnerability is a relative measure. The analyst, whether the vulnerable themselves, external aid workers, or various societies that include both the vulnerable and interventionists, must define what is a critical level of vulnerability. • Everyone is vulnerable, although their vulnerability differs in its causal structure, its evolution, and the severity of the likely consequences. • Vulnerability relates to the consequences of a perturbation, rather than its agent. Thus people are vulnerable to loss of life, livelihood, assets, and income rather than to specific agents of disaster, such as floods, windstorms or technological hazards. This focuses vulnerability on the social systems rather than the nature of the hazard itself. • The locus of vulnerability is the individual related to social structures of household, community, society, and world system. Places can only be ascribed a vulnerability ranking in the context of the people who occupy them. These concepts of vulnerability shift the focus of vulnerability away from a single hazard to the characteristics of the social system. Vulnerability is explicitly a social phenomenon, a threat to a human value system. Places and ecosystems can only be termed vulnerable if we ascribe human value to them. Vulnerability changes over time, incorporating social responses as well as recurrences of hazardous events. Bohle et al. 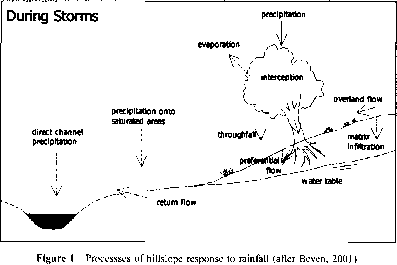 (1994) captures the dynamic nature of vulnerability (Fig. 4). 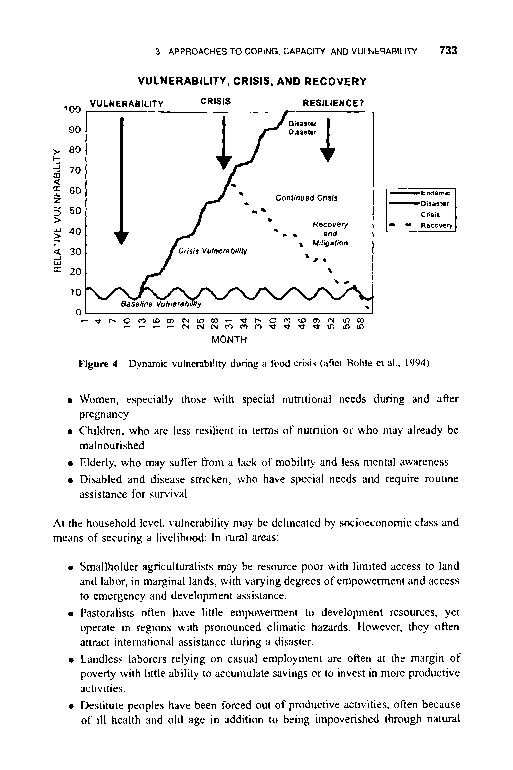 In this illustration, vulnerability begins to increase at the end of the first year, reaching a crisis at 30 months. Here the outcome of the crisis is uncertain. In a resilient society with appropriate interventions, recovery and mitigation can bring vulnerability back down to baseline (or lower) levels. Unmitigated, or in conjunction with another event such as civil strife following drought, the crisis may become a disaster. Or, some groups and communities may continue in crisis, on the edge of disaster. Social groups vary in the structure of their vulnerability. For example, the rural landless (without nonagricultural incomes) are typically more sensitive to food shortages, with less on-farm storage and buffering capacity than smallholders. Thus, the trajectories shown here may be sharper and the outcome different for different groups, even in the same region. Figure 2 Structure of vulnerability and disasters. Dynamic pressures are processes thai translate social, political, and economic structures in relation to specific types of hazards into particular forms of insecurity. Regional or global pressures such as rapid population growth, urbanization, war, foreign debts, epidemic disease, export promotion, etc. have effects on the local or regional level. Some of these pressures have a universal character, others are specific to a certain region or society. Unsafe conditions reflect situations and circumstances specific lo a region and time, in conjunction with a particular group of people. They reflect specific forms of vulnerability related to specific hazards (Blaikic et al., 1994). Figure 3 Vulnerability Matrix for the U.S. Famine Early Warning System. Vulnerability is portrayed as a progression from slightly vulnerable to famine. At each level of vulnerability, households pursue different strategies—from production to survival. Consequently, different forms of intervention are warranted for different levels of vulnerability, from targeted development assistance to supporting coping strategies and ultimately emergency food relief [U.S. Famine Early Warning System (FEWS), 1992]. disasters and other causes. Where the destitute migrate to urban centers, they may have more opportunities for assistance and work, although this depends on the nature of the receiving society. • Unemployed destitute in urban areas may be incorporated into social welfare systems (often informal), but suffer significantly in times of disaster if the numbers become too large and if relief fails to target their pressing needs. • Underemployed poor people, comparable to landless laborers, are on the margins of survival. A slow deterioration in the economy can affect this group, often leading to a major but largely hidden crisis. • Refugees are the most visible vulnerable population, usually swelling in numbers after a disaster. They may also be vulnerable to further hazards, for instance, while attempting to return to their homes and occupations or in camps with inadequate protection against floods, heat, and frost, among other hazards. Yet, this group tends to benefit from its visibility and various formal channels of assistance. • Occupancy patterns and who is in substandard buildings, when, for how long, etc. • Health, water, power, and communication infrastructure that sustain life as well as provide channels for relief assistance.